It is almost sunset, on one of those warm summer evenings when the light touches everything with gold, and every direction one turns, there’s another picture to be painted. You’re walking along the top of the cliffs just north of the Santa Cruz Lighthouse, above Its Beach. 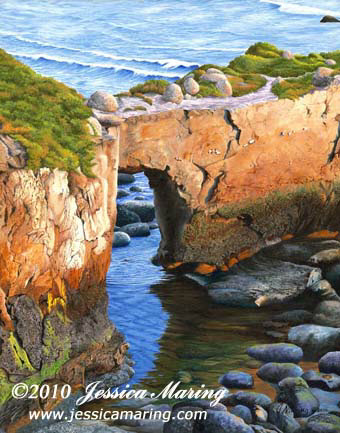 This narrow wall of stone, with its natural arch, points across the Monterey Bay. The tide is out, and ripples burble and plash between the rocks. Seagulls scream, and from the nearby wharf come the honking barks of sea lions.